It wasn't a good opening night for the Bulls Thursday, losing 127-108 to the Philadelphia 76ers. Not that anyone really thought the Bulls had much of a chance with the 76ers home following a tough loss in Boston and at full strength. While Bulls starters Lauri Markkanen and Kris Dunn were out, the latter with the birth of his first child. So things, predictably, didn't go particularly well after an appealing and competitive first half in which the Bulls led 41-38 after one quarter and trailed by seven at halftime despite, yikes, giving up 65 first half points. 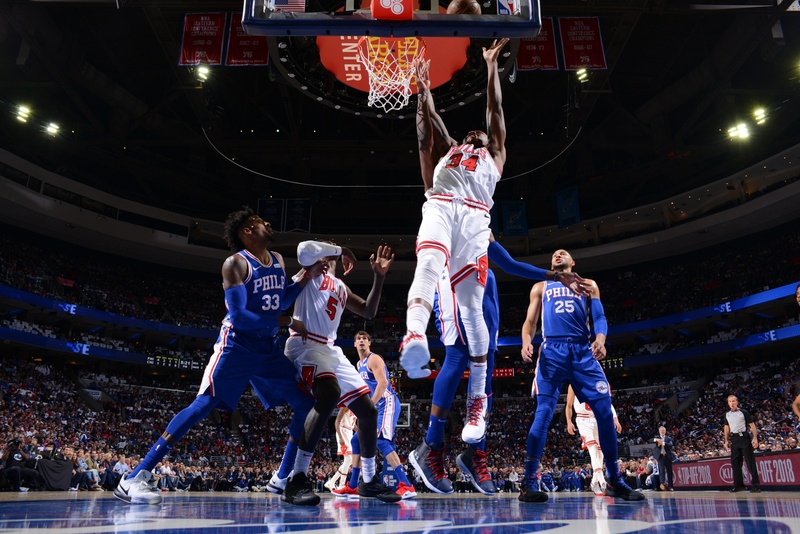 Joel Embiid with 30 points, 12 rebounds and four blocks and Ben Simmons with a triple double with 13 points, 13 rebounds and 11 assists were too much for the Bulls starting Cameron Payne at point guard and a rookie, 19-year-old center against Embiid. Still, there were positives, like 30 points from Zach LaVine, 20 points and 11 rebounds from Bobby Portis, steady guard play off the bench from Ryan Arcidiacono and what is believed to be the first NBA post game use of the term "molly whopped" to describe the crucial events of the game. I'm still tingling over having been there to hear it in person. Jabari Parker and Antonio Blakeney each had 15 points and 10 for Justin Holiday. Wendell Carter Jr. in his debut had eight points and three rebounds. Arcidiacono had eight points and eight assists while emergency starter Cameron Payne was scoreless and benched after the middle of the third quarter. The 76ers had eight players score in double figures. "We came out ready to play, for sure," said LaVine, who often was breathtaking in his opening probes to the rim and deep shooting with 15 first quarter points. "But there are four quarters to a game. We have to play defense a little bit more. Second quarter, we got a little stagnant, third quarter they came and just molly whopped us and we couldn't recover from it. It was a 19-3 run and we were stumbling, just trying to get back into it. We made a good push at the end, but that's what we have to learn from. They were a playoff team last year; they hit adversity before. We hit adversity in the third quarter and we have to respond to that better." Or face being molly whopped again. "Got to tip your hat to them," said LaVine. "They lost their first game; we lost ours. They defended home court and we have to do the same thing when we play Detroit (Saturday)." There's no fault to LaVine, who produced from his promise, emerging immediately not only as the team's primary scoring option but a star in the making with his athletic daring and brilliant finishing at the basket for multiple three-point plays. The Bulls settled too much otherwise for jump shots with LaVine attempting seven of the team's 12 free throws. 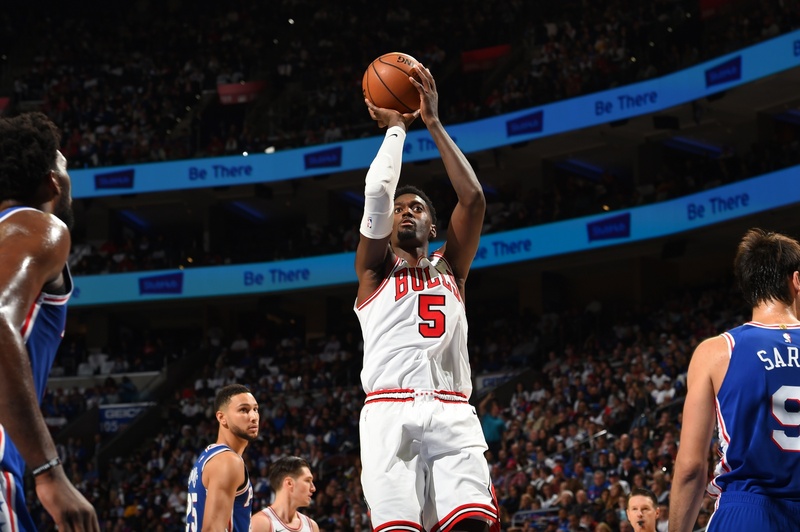 The 76ers attempted 30 free throws and had a 20-3 edge in fast break points, 18 more points on free throws and 17 points from turnovers to three for the Bulls. That was a hustle board tilt for the 76ers. "I feel good," said LaVine, who also had three blocks. "I put a lot of hard work into the offseason; that's what I expect of myself and I know Bobby is right there with me. Bobby had it going and that's what he's been doing. But we've got to be better; I have to be better out there. I had a lot of mistakes I could have done better. As a team we have to do a better job of being able to take a punch and be able to get back up; third quarter we laid down for a little bit. "Year after that ACL I feel I'm back to myself, athletically, speed wise, quickness, my legs under me," LaVine added. "Just needed you all to give me a little bit of time. I was about 70 percent last year. It feels good to be back in my own skin again." Portis, especially with his post offense, really was the only other offensive threat with the two starters and Denzel Valentine out. "The post is my strong suit," Portis acknowledged. "Anything I do on the perimeter with threes is extra (he did make three of six). I'm really comfortable in the post; just trying to bring energy to the team. It was fun out there finally going out to play (in the regular season), but we want to win." It will remain a work in progress with Markkanen out perhaps another three to four weeks. It's possible Dunn will return for Saturday's home opener. So it was a near impossible dream Thursday against a fully armed 76ers team projected as a top four team in the conference. For a while, however, the Bulls perchance were dreaming. Ay, there's the rub. 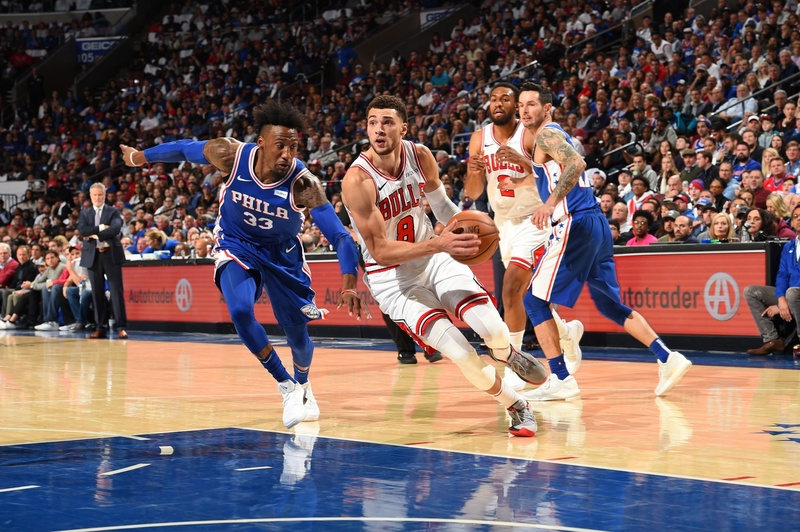 With LaVine's three to start the game, the Bulls answered every 76ers volley with an even harder overhead of their own, scoring on 14 consecutive possessions in the first quarter with three LaVine driving scores through thickets of Philadelphia arms and Portis bulling his way across the lane for five scores in five attempts. "That's what you guys expect from me, what I should expect from myself," said LaVine. "It's a little more now because we don't have that firepower. We miss our dude Lauri; I definitely do. We miss KD. Congratulations to him having his first born kid; that's very understandable. You are going to go through those type of things and it's next man up. We have to still be a good team from that, so its upsetting. A little bit of a punch to the gut." The Bulls shot 61 percent in the first quarter with the most points in franchise history in the first quarter of an opening game. But the 76ers even trailing were percolating along at 67 percent and about to pour it on, on the way to their most points in an opening game in 30 years. They took the lead in the second quarter, though the Bulls were battling even as their shooting went awry. They were even on the boards and still moving the ball. "You come in at the break down seven, you're still in the game and you have a chance," noted Bulls coach Fred Hoiberg. "We were scoring easy (to start). Then the second quarter we got very stagnant, started taking bad shots and that got them out in transition and then third quarter was the difference. The third quarter we missed a couple of easy ones to start. They capitalized on it and then when we started missing shots we stopped guarding and rebounding. They out rebounded us by 16 (the second half, 11 in the third). That was a huge key to the game. Getting back in transition, they had 20 on the break, 17 second chance points. When we got cold on the other end it affected our defense; that's got to get better, has to improve." The 76ers weren't electric offensively, shooting 47 percent overall and 33 percent on threes. But Embiid against the smaller, younger and less experienced Carter was too much. Same with Simmons against the overmatched and smaller Bulls guards, though LaVine's defense was credible when he went against Simmons. "It's so tough because they got those two dudes over there," LaVine acknowledged. "Joel is like the second biggest dude in the NBA and he can shoot and move his feet, block shots and get to the rim. Simmons is a 6-10 point guard who throws backward passes to people, so it's tough. I think in the first and second quarter we did a good job guarding them even though Wendell got in foul trouble. But he was still playing him solid. A tough first game, but he didn't lack any confidence, made him take some tough shots. But he will make them. It came down to where they used their experience and put their grit to it and were the more aggressive team." The Bulls were scrambling all over the court with those makeshift lineups trying to help and recover against both Embiid and Simmons, which is task enough. "Eventually they are going to pick you apart by spreading the floor," noted LaVine. Then perhaps two of the most unlikely shooters, Robert Covington and Landry Shamet, the latter who was forcing a lot of program purchases, each made four three pointers. "He (Embiid) catches you off guard when you come back from helping and it's tough to get in front of him because he is so big and strong," said Carter. "It is something I will learn and by the next time we play them I'll have it down pat. It was a unique situation, but I feel it will help me in the long run." It proved a short run for the Bulls after that. 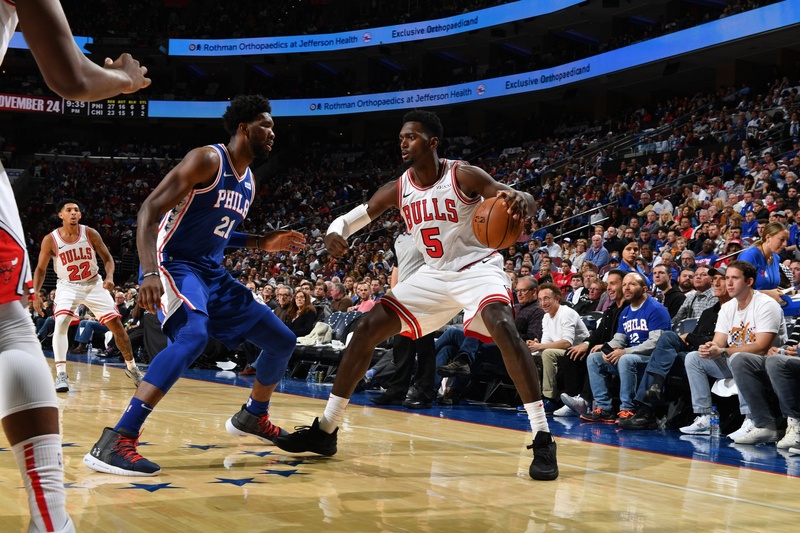 The 76ers with a third quarter zero to 60 while the Bulls still were revving started the third quarter 19-3, quickly leading by 23 points and it was over. Parker had two points until then. Both Portis and LaVine drew their fourth fouls in that barrage and went to the bench. And then it was party time in Philadelphia with the crowd urging on the exasperated Markelle Fultz, breaking into a standing ovation when he made the first three pointer of his career. Former LSU teammates Simmons and Blakeney also took off their jerseys for an exchange after the game. It was one of the few things the Bulls won as Simmons' clearly sells for more on E-bay. It was 102-76 Philadelphia after three quarters. And while Hoiberg said he liked what he saw in a more competitive fourth quarter, it was 102-76 after three quarters. "Got 81 more now," noted LaVine.